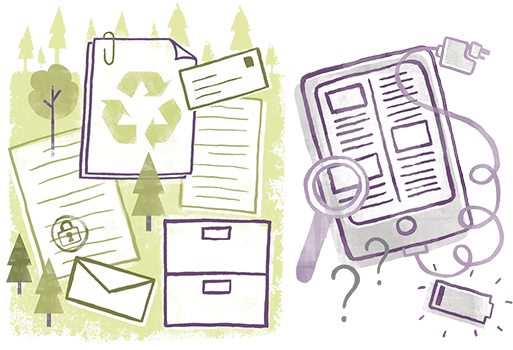 “Go paperless”, “go green” and “save trees” are common themes these days as many corporations and governments encourage their customers and employees to swtich to electronic transactions or communications. But are appeals to help the environment by eliminating paper based on sound science or on marketing strategies aimed at cost cutting? In a multimedia world, print and paper may be the sustainable way to communicate. Electronic waste is now the fastest growing component of the municipal waste stream. The average Australian generates nearly 20kgs of e-waste every year. The amount of electronic products discarded globally has sky rocketed recently with 20-50 million tonnes generated every year. Organisations that truly want to make responsible environmental choices should do so based on factual verifiable information. Some marketing strategies aimed more at cost cutting than saving the planet, have seen misleading campaigns being released. The campaigns suggest to consumers online solutions are better for the environment. These claims are unsubstantiated. Customers’ convenience for online access are a necessary requirement in the 21st century. However rather than asking which is better, paper or electronic communication, we should use life cycle thinking to determine which combination of the two has the least impact on the environment while best meeting social and economic needs. An online search emits 0.7g of CO2 every search made, whereas a business card emits less than 0.12g of CO2 over the card’s entire lifetime. -M. Berners-Lee, How Bad Are Bananas? The Carbon Footprint of Everything, 2011 Australian Paper Industry Association, Paper Part of Everyday, 2010. -Australian Competition & Consumer Commission, Green Marketing and the Australian Consumer Law, 2010.